The Undoing Project is about the fascinating collaboration between two men who have the dimensions of great literary figures. They became heroes in the university and on the battlefield―both had important careers in the Israeli military―and their research was deeply linked to their extraordinary life experiences. In the process they may well have changed, for good, mankind’s view of its own mind. A book about romance disguised as a history of psychology in economics. I found this book a little hard to read. It extends to too many subjects, goes here and there and doesn't dwell long enough in one subject to maintain the reader's interest. 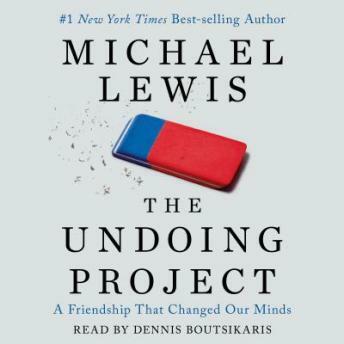 What you'd hope for from Michael Lewis. He writes well about complex ideas, and brings characters to life. If you are into things like behavioral economics, psychology, group psychology, economics, public policy, sociology, history, then you'll enjoy at least some of this book if not all. In fact, if you are into those topics, i think you SHOULD read this book. The trend of algorithms and AI replacing human choice patterns in society, and our own individual tendencies toward irrational choices are subjects worthy of deep consideration. The Undoing Project unpacks and details the logic, pros, and cons behind this trend. You will think and reflect deeply if you read this book, no doubt about that. As a story it lacked any kind of compelling narrative, other than the arc of the friendship, which is beautiful in its own right, but is hardly enough to carry us through the entire book. It is, before anything else, and idea book. If you aren't into the topics than you won't make it through without falling asleep. Concepts get over explained or redundantly addressed several times, but for me, this just helped me grasp the central ideas and insights pioneered by the lead characters of this book, so I didn't mind the redundancy.